Thousands of times per year in the United States, automobile drivers are temporarily blinded by the high beams of oncoming cars. This makes American roadways more dangerous and increases traffic deaths. The technology to reduce the discomfort and danger of headlamp glare exists, but federal regulations governing automotive safety make it difficult to bring it to market, along with many other technologies that can improve safety, increase comfort, and control costs. If regulators cannot approve superior headlamp technology in a timely fashion, the prospect for regulatory approval of more complex automated driving systems appears dim. This must change. Currently numbering 73, FMVSSes impact virtually every aspect of motor vehicle design and performance, covering everything from brake hoses to window glazing. Most of these standards incorporate in whole, in part, or by reference, voluntary consensus standards (VCSes) developed by private voluntary consensus standards bodies (VCSBs). Unfortunately, FMVSSes administered by the National Highway Traffic Safety Administration (NHTSA) frequently incorporate outdated VCSes or, worse, rely on government unique standards largely untethered from the recognized best practices of automotive engineers. This effectively prohibits new vehicle technologies—some that increase safety, but others that simply provide additional comfort or lower costs. As automotive technology continues its rapid evolution into automation and connectivity, this problem will only get worse. Fortunately, Congress has tools to refocus NHTSA on modernizing federal motor vehicle safety standards so they adhere to the latest voluntary consensus standards. This paper provides a background on private automotive standard-setting, legislative and regulatory history in the area, and suggested legislative text to accomplish this reform. Private Standards and Federal Automotive Safety Regulation. Since its inception, the National Highway Traffic Safety Administration has relied heavily on voluntary consensus standards bodies to shape federal motor vehicle safety standards. 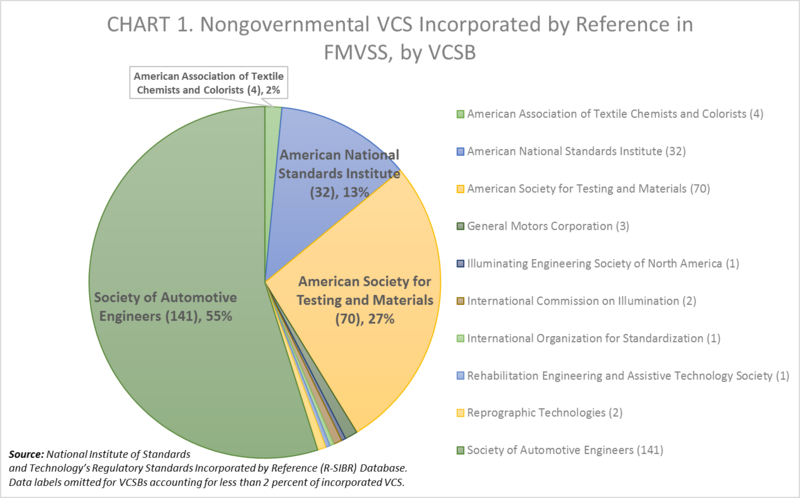 These VCSBs, such as the Society of Automotive Engineers (now known as SAE International), are private membership originations that draft and publish voluntary consensus standards through an expert committee process. The U.S. Code of Federal Regulations currently contains 73 federal motor vehicle safety standards. FMVSSes promulgated by NHTSA incorporate by reference 257 nongovernmental voluntary consensus standards, according to the National Institute of Standards and Technology’s Regulatory Standards Incorporated by Reference (R-SIBR) Database. Of those, three voluntary consensus standards bodies account for 95 percent of VCSes incorporated by reference (see Chart 1). Like the underlying regulations, these incorporated VCSes carry the force of law and impact the entire U.S. automobile supply chain. Incorporation by reference of a publication is limited to the edition of the publication that is approved. Future amendments or revisions of the publication are not included. As a result, most VCSes incorporated in regulations are seriously out of date, sometimes by decades (see Chart 2). In the R-SIBR Database, the median edition year of VCSes incorporated by reference in FMVSSes was 1980. Regulatory agencies such as NHTSA are prohibited from referencing a standard series so that the underlying regulation automatically refers to the most current VCS whenever a VCSB decides to publish a revision. This is understandable, as automatically updating regulations to reflect the latest VCS would arguably delegate power to private entities contrary to constitutional limits and flout the due process and transparency aims of the Administrative Procedure Act’s notice-and-comment rulemaking requirements. The Problem of Outdated Federal Motor Vehicle Safety Standards. Congress’s adherence to sound constitutional and administrative procedure principles in the case of VCSes is laudable. However, this has had the effect of locking outdated standards into law, which may then deny producers and consumers the latest production practices and technologies. In the case of FMVSSes, one prominent recent example relates to a new class of lighting technologies known as adaptive driving beam (ADB) headlamps. FMVSS No. 108 dictates vehicle lighting requirements. In recent years, automakers have developed ADB headlamps that automatically adjust roadway illumination to minimize glaring light toward oncoming and leading vehicles. Unlike traditional headlamps or semiautomatic beam switching lamps, there are no discrete high and low beams to switch between. Individual LEDs switch on and off when ADB systems detect an approaching vehicle, allowing the ADB-equipped vehicle to maintain lighting levels approaching high-beam illumination while reducing glare to below low-beam levels. Increased glare from higher-mounted headlamps on sport utility vehicles and high-intensity discharge headlamps has been controversial for two decades. Regulators have been searching for technological solutions to this problem. In 2001, for instance, a NHTSA request for comments on lighting glare generated 5,788 public submissions, the most ever received by the agency regarding lighting. Unfortunately, FMVSS No. 108 relies on decades-old standards. It also requires discrete high and low beams, thus effectively prohibiting ADB technology that has been available in Europe for years. It was previously believed by many automotive engineers and lawyers that incorporating an earlier SAE Recommended Practice J565 on semiautomatic headlamp beam switching could allow for ADB deployment in the U.S. While FMVSS No. 108 explicitly permits semiautomatic beam-switching systems, NHTSA argued that Recommended Practice J565 lacked necessary vehicle-based performance requirements to permit deployment of ADB lamps. In response, SAE International developed Recommended Practice J3069 to meet NHTSA’s demands on performance requirements, which it published in 2016. NHTSA has yet to undertake the necessary rulemaking to integrate ADB lamps into FMVSS No. 108, though it has indicated it plans to publish a notice of proposed rulemaking on ADB lamps in June 2018. This delay has denied American consumers superior and likely safer headlamps. This is just one example of NHTSA’s failure to conform its federal motor vehicle safety standards to current voluntary consensus standards. This problem, if left unaddressed, will become more severe in the near future as automated vehicles are developed. An automated vehicle concepts scan, doing the same in the context of 13 different vehicle concepts on the driving automation system spectrum. This problem not only threatens consumer access to superior technologies, it puts lives at risk were automated vehicles to prove substantially safer than human-driven vehicles. How Congress Can Promote Motor Vehicle Safety Regulatory Modernization. To date, Congress has done little to address the clear problem posed by the freezing of standards incorporated into regulation. Some legal analysts have blamed a lack of agency resources, though agencies’ collective failure can just as easily be ascribed to misallocations of resources. Both the CPSC’s ATV regulation and the automated vehicle definitions in the SELF DRIVE Act provide an important update mechanism that places the ultimate decision on whether to revise existing regulations with regulators. This addresses any potential non-delegation objections and enables the agencies to reject revisions on practicability grounds. Importantly, it forces agencies to make a choice whenever an incorporated VCS is revised: open a rulemaking to revise the relevant regulations or articulate why not. Applying such an update trigger mechanism across NHTSA’s FMVSS regime for all incorporated VCSes would certainly be more ambitious than one that applies to a single VCS. However, it would provide benefits beyond those accrued from modernizing FMVSSes. It would refocus NHTSA on regulatory housekeeping, reduce its discretion to initiate extraneous rulemaking projects, and provide greater transparency to the motor vehicle safety regulatory process. (1) If a voluntary consensus standards body revises a voluntary consensus standard incorporated in whole, in part, or by reference in any Federal motor vehicle safety standard prescribed under this chapter, it shall notify the Secretary of the revision. The Secretary shall publish a notice in the Federal Register to inform the public of the new voluntary consensus standard unless, within 90 days after receiving notice of the new voluntary consensus standard and after opening a period for public comment on the new standard, the Secretary notifies the voluntary consensus standard body that the Secretary has determined that the new voluntary consensus standard does not meet the need for motor vehicle safety, or is otherwise inconsistent with the purposes of this chapter. (2) If the Secretary does not reject a voluntary consensus standard revised by the voluntary consensus standard body as described in paragraph (1), the Secretary shall promptly make any conforming amendments to the regulations and standards of the Secretary that are necessary. The revised voluntary consensus standard shall apply for purposes of this chapter. Conclusion. It is without dispute that the outdated voluntary consensus standards incorporated throughout the Code of Federal Regulations pose a policy challenge. If private standards are to be used in lieu of government unique standards—and there is a strong argument for doing so—regulatory agencies must do a better job of ensuring that regulated entities are governed by modern best practices. Fortunately, while Congress has largely neglected to address the problem, in the past it has displayed an ability to design legislative mechanisms to resolve it. As with all-terrain vehicle regulation and the Consumer Product Safety Commission, Congress should enact a regulatory-update trigger mechanism for federal motor vehicle safety standards, so that whenever a voluntary consensus standard incorporated by federal motor vehicle safety regulations is revised, that revision creates a decision point for the National Highway Traffic Safety Administration. That agency should either begin the process of amending applicable regulations or articulate a safety, legal, or other practicability basis for rejecting the revision for incorporation. The current failure to modernize motor vehicle safety regulations to reflect the latest consensus technical standards denies American automakers and consumers superior and likely safer vehicle technologies. With the deployment of automated vehicles on the horizon and their promise of far safer driving, failing to address this problem could result in legal prohibitions on safer technologies, which would needlessly result in increases in automotive fatalities, injuries, and property damage.